The Boston Student Arts Network (BSAN) today announced the film finalists for its upcoming Boston Student Film Festival (BSFF). Honors will include “Best of the Fest—Audience Pick,” “Best of the Fest—Jurors Pick,” and four individual juror favorites prizes. The winner of the “Audience Pick” award will have the opportunity to have his or her film showcased at the upcoming New England Film Festival. Runners up will receive trophies and filmmaker gift bags. The twelve films will be screened online at BostonStudentFilmFest.org beginning Monday, March 18 through Sunday, March 31. During this time, interested audience members can watch the films and vote for their favorite film to continue on to the New England Film Festival. 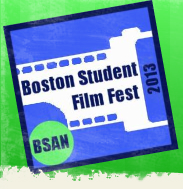 0 Response to "Boston Student Film Festival Finalists"